Kids 10 and up will have the most fun, but the show welcomes kids as young as 4. All ages will enjoy the lively music and whimsical story with a splash of fairy tale. With fun, laughter and an uplifting story, FINIAN’S RAINBOW breaks barriers and raises poignant, topical issues. Topics like: racial harmony, justice, social equality, abuse of power, living beyond one’s means, the notion of HOPE and HOME, the importance of LISTENING to one’s heart, and the ability to find peace and happiness with the important and simple things in life. For generations we have been teaching our children to understand themselves and the world around them through engaging stories. Theatre is a wonderful way to share these stories. Tweet this: RT @stephwiestling *Win 4 tix to fam-friendly Broadway show, Finian’s Rainbow!! * http://tinyurl.com/finians -Pass it on! Enter once each way for a total of 3 entries per person! Contest ends Tuesday, Dec 1st at midnight. Winners will be notified by email or Twitter, depending on your entry. Huge thank you to: Finian’s Rainbow, St. James Theatre, 246 West 44th Street, New York, NY 10036, www.FiniansOnBroadway.com, for this great offer! I can be in NYC in 22 minutes, my family would be thrilled to win, how exciting! I’d love to take my 6-year-old to her first Broadway show. I’ve heard great things about Finian’s Rainbow, so I think it would be a great first show! 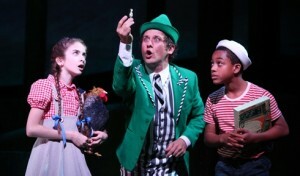 I’ve never seen Finian’s Rainbow, but I’d love to get my nephew to a show soon. Thanks for the chance! Good luck all! I want you to know that I’m traveling this weekend starting Thurdsay and will get comments posted in the evenings, so don’t worry if your comment doesn’t post right away. Monday will be back to normal! 😉 Keep entering!! I go into NYC every chance I get. This would be great! Our children would enjoy this. I love when they bring the classic shows back to Broadway, Hope I win so I can see it!!! Would love to take my nephews. I haven’t been to a true Broadway show in a long time! My two older kids would love to go, and my youngest may be too young (3yrs?) but maybe if we like it we could take her in a year or two! Sounds like a great time! Hope to win! I’d have to leave my husband at home so I can take all 3 kids. They’d really love this. We did this play in Junior High and I would love to revisit it. I saw it was coming last time I was in the City and was planning on returning to see it. Would love the tickets. I saw this show, way back when, in its original Broadway production. It was great. I’d love to see it again. Thanks for this offer. oooh we would so love to see Finian’s Rainbow! We ventured to the city a couple of months ago to go see Mary Poppins – and that was wonderful!! NYC is only a trainride away. You don’t specify dates for the show- hope it’s late enough in January that I can go, since I travel for the holidays. I even followed @stephwiestling although that was not required! Hi! I would love to win these tickets! Would love to see such a fantastic play. Hope I am in the running… could use a night out! Wow…. I could really use a night out with my kids!!! John, you are definately in the running! Comments only count as one entry, so just the first one counts… you can get another entry by tweeting it or joining the community if you wish. Either way, you’re entered, so good luck!! Using Random.org, Naneen Levine’s comment was the winning entry! THANK YOU to ALL of you who entered! Check back for more fun giveaways here at BKFT soon!! And a VERY SPECIAL THANK YOU to Mark at Finian’s Rainbow for making this possible!!! I hope all of you get a chance to see Finian’s Rainbow in NY at some point. If you do, please come back here and tell us about your experience! Kids will surely love it and enjoy it, it will be a great family bonding,must go and watch it with whole family. To kids and kids at heart,must go and see it.